When is the 2019 Naperville Half Marathon & 5K? 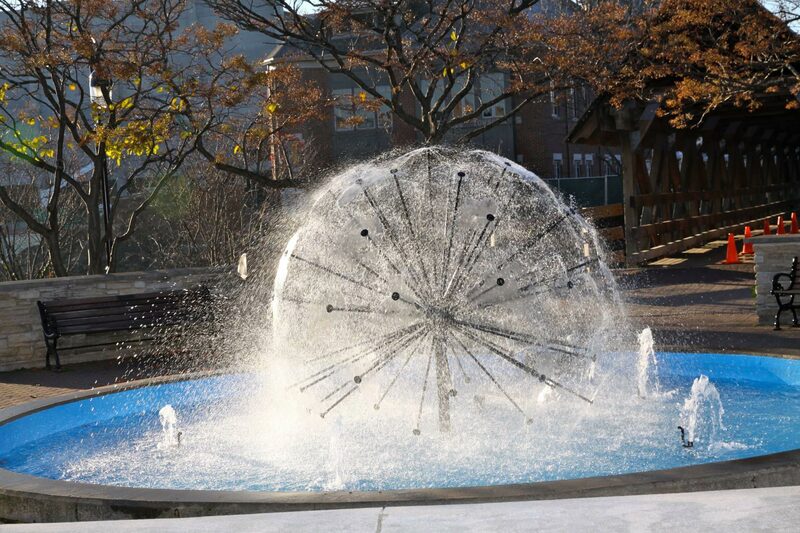 The 2019 Naperville Half Marathon & 5K will take place on Sunday, October 20. Both races begin and end on Eagle St., just north of Aurora Ave. The half marathon begins at 7 a.m. The 5K begins at 7:15 a.m.
I’d like to switch from the Half Marathon to the 5K, is that possible? YES! To switch from the Half Marathon to the 5K, run the 5K on race day and make sure you enter the 5K finish chute on the west side of Eagle to receive your 5K medal. NOTE: running the 5K instead of the Half will affect your Legacy and Multi-Race Challenge medal status. I’d like to switch from the 5K to the Half Marathon, is that possible? Yes, you can modify your race through your Events.com account, subject to availability. There is an upgrade fee to change from the 5K to the half marathon. The paid 5K race fee will be credited toward your new race. YES! Just bring a copy of their ID with name and date of birth. A picture of the ID on a phone is acceptable. Is this a good race for a first time half marathoner? ABSOLUTELY! This is a scenic course with spectator spots along the course so your fan club can cheer you on. Register 3 or more runners at time of registration and each runner receives a $5 discount! Here’s how it works: Your group will need to designate a one person to register your entire group. When you log into the registration site choose how many people you are registering (3 or more is required for the discount). Fill in the required information for each registrant and pay with a credit card. The group discount will be automatically applied at checkout. Note: the group discount is valid ONLY for the Half Marathon. Are runners who are under 18 allowed to register? Runners age 14 and over on race day can register for the half marathon, but should be sure it will not interfere with their high school team eligibility before registering. Runners age 8 and over on race day can register for the 5K. We won’t predict the weather so far ahead of time but historically the day brings pleasantly cool temperatures with a high of 60 degrees and a low of 41 degrees. And cool temperatures mean faster race finishes. The course road blocks will be taken down and aid stations will begin closing at a 13:45 per mile pace for the half marathon and a 20 minute per mile pace for the 5K, which is a 3 hour total half marathon or a 1 hour 5K time. We ask that all runners and walkers that register for this event are prepared to complete their event during the time restriction listed above. Those who finish outside of the time limit will not be recorded as official finishers and may not receive full on-course support from Aid Stations and traffic personnel. Please indicate your anticipated finish time during registration. I am registered. How do I change my email address or any other personal info? That’s simple. Confirm your registration and choose the option to update your data. You will not be able to update your name or email. They are you identity in the registration system. You will have to re-register, and email us at info@naperville26.com so we can void and refund your incorrect registration. How many runners will be on the course? For 2019, we anticipate 5,000+ runners, split between the half marathon and 5K. The half marathon will begin at 7 a.m. The 5K will begin at 7:15 a.m. Yes! You’ll receive your official runner gear check bag at packet pickup on race weekend. There will be convenient drop off and pickup near the race start/finish area. Be sure to put some warm clothes into your Gear Bag to put on after your race. What amenities do you feature at the Aid Stations and where are the stations located? Qualified medical personnel will be on the course. If you are in need of assistance, get to the nearest aid station and someone will help you. If you cannot get to an aid station please alert a passing runner who will let someone know at the nearest aid station. All medical personnel will be wearing a medical vest as well as their race credentials. What fuel will be available on the course? Gatorade Endurance Formula is on course at this year’s Healthy Driven Naperville Half Marathon, fueling you throughout the entire race. As part of a five-electrolyte blend, which includes sodium, potassium, calcium, magnesium and chloride, Endurance Formula is a specialized sport drink designed to help maintain hydration during prolonged training and racing when fluid and electrolyte losses can be significant. It contains nearly 2x the sodium and more than 3x the potassium of Gatorade Thirst Quencher to help maintain hydration and proper fluid balance and help replace the critical electrolytes lost in sweat during these occasions. Find Endurance Formula online at https://www.gatorade.com/products/endurance or at a Sport-Specialty retailer near you. Can my friend pace me for part of the race? NO. The only people allowed on the course during the race are registered runners. We provide an official team of pacers for you to run with. A participant who has received pacing by persons not officially participating in the event may be disqualified. Having a friend join you for part of the race either on foot or bicycle is also frowned upon by other runners and may earn you some ill will. NO. The half marathon will start at 7:00 a.m. The 5K will start at 7:15 a.m.
Can I use my mp3 player? We allow the responsible use of mp3 players, but please be aware of those around you on the course for everyone’s safety. Each FINISHER of the Healthy Driven Naperville Half Marathon & 5K will receive their medal when they cross the finish line. How do I earn a Chicagoland Triple Crown or Valley & ‘Ville medal? Visit our Distance Challenge to learn how to earn one of our Chicagoland Distance Challenge medals. 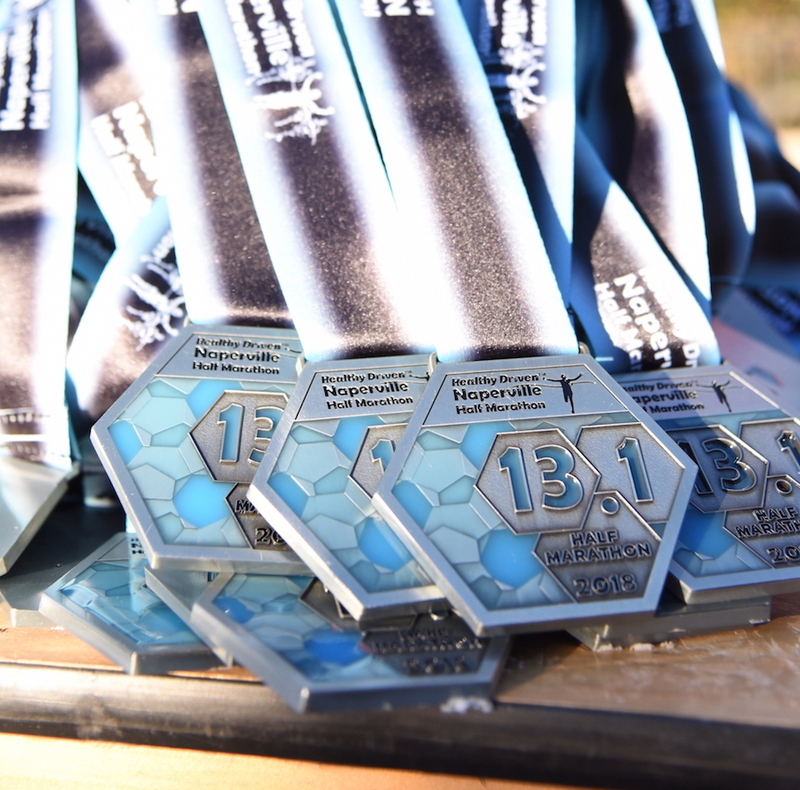 page to learn how to earn one of our Chicagoland Distance Challenge medals. Our race will be timed using disposable timing tags, which are attached to your shoe. Is there a wheelchair division? Unfortunately our 2019 course will not be able to accommodate a wheelchair division. For insurance and logistical restrictions: no dogs (with the exception of a service dog), no strollers, no bicycles, no roller blades, no in-line skates, and no wheeled vehicles are allowed in the half marathon. Strollers are permitted in the 5K. Strollers will be in a unique corral with an anticipated start time of 7:25 a.m.
What is the Flag Warning System? There will be a simple flag color system along the course to help warn participants of weather related or course related problems. Flags will be located at each aid station along the course. Green Flag: Running on schedule: Course and weather acceptable. Yellow Flag: Weather advisory: runners take appropriate precautions. Red Flag: Extreme weather: runners advised to slow or walk. Black Flag: Race is closed. Make your way back to the finish line, but no official finish times will be given. The Half Marathon features Top 3 overall awards, and also Age Group awards, which are 3 deep for Male and Female runners. All awards must be picked up on race day. They will not be mailed. The age of a participant on the day of the race determines his or her Age Group / Masters classification. How fast will you sell out? It is difficult to determine how fast the race will sell out each year. Our advice is the REGISTER EARLY to secure your spot at the start line. I am injured and/or cannot run the event (family commitment, work obligation, etc.). Can I donate my entry or transfer my entry to someone else? No. All registrations are nontransferable and non-refundable as stated in the waiver you sign when you register. Please note that according to our rules, transferring or selling registrations or bibs is not allowed and both runners will be disqualified and banned from future events. Can I buy someone else’s bib? No. Buying a bib is a “bib transfer” and transferring or selling registrations or bibs is not allowed. Both the buyer and the seller will be disqualified and banned from future events. Can someone GIVE me their bib? No. Giving a bib is a “bib transfer” and transferring of bibs is not allowed. Both the buyer and the seller will be disqualified and banned from future events. Yes! Learn about our Race Deferral Option here. Are there any opportunities for runners to volunteer? Yes! There are several opportunities for runners to volunteer before and after the race. Learn more about volunteering on our volunteer page. The Healthy Driven Naperville Half Marathon & 5K follows and participants are subject to, the rules specified by USATF. Please visit usatf.org for additional information concerning the rules mandated by the governing bodies for the sport.